PBS debuted a NOVA Special Tuesday evening, entitled "Marathon Challenge." 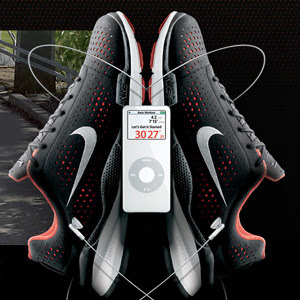 It follows a group of predominantly sedentary people through a 9-month challenge of training to run the 2007 Boston Marathon. Not surprising, it was a great program that was ironically produced by a friend of a friend. Tufts University was where the majority of the fitness testing occurred as the team was also trained by Uta Pippig and nationally-renowned nutritionist Dr. Miriam Nelson, the latter of whom I had the privilege to meet a couple years ago at a seminar. So yeah, I'll admit to watching The Biggest Loser, but tonight may have been the last time. As much as I like to watch people push themselves to achieve their respective goals, I was appalled to see Bob, one of the trainers, suggest people do crunches to lose abdominal fat. His exact words were "crunches eliminate excess fat around the waistline-" wow. How much further from the truth could this guy be?!?! We all (should) know by now proper cardiovascular exercise and simply watching what you eat and drink are the key players to trimming the waistline. Shame on you Bob. 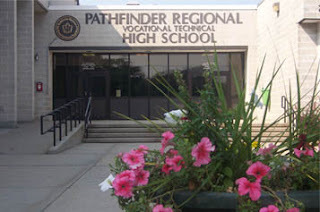 Thank you everyone in Palmer for having me out today to the Pathfinder Regional Vocational Technical High School library to conduct the exercise and stretching clinic portion of your "Heart Matters" program. You all did wonderful and were so positive and energetic. I hope to come visit again some day down the road to check in with all of you. Good luck with the rest of your program. 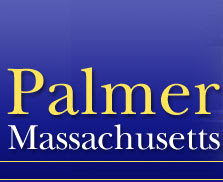 Now I know where Palmer, Massachusetts is! 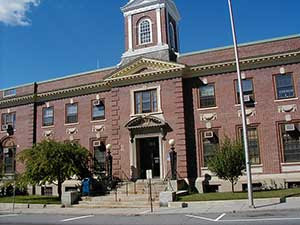 Thanks again to the Town of Athol for having me out today. You all did a great job learning how to exercise with resistance bands. It's nice checking out different parts of the state. I take for granted sometimes how easy the commute is (all of 6 miles round-trip) when I train my clients. And remember...get in and get out out. 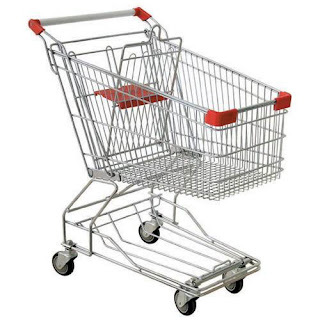 Don't dilly dally up and down the aisles. Get what's on the list and leave. Yes not every entry is about fitness in my blog- as you've probably discovered. 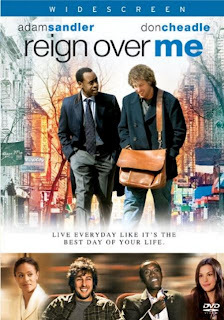 Anyway, great movie to check out: Reign Over Me with Don Cheadle and Adam Sandler. Let me know what you think. If you've got any interest in exercise physiology, you're probably come across articles about athletes training at high altitudes. One method of training that mimics this is the use of hypoxic chambers. 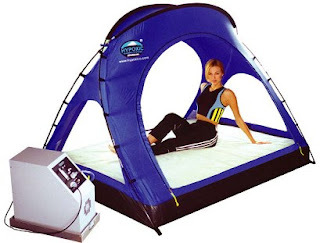 Not to be confused with hyperbaric chambers which increase the amount of oxygen in a sealed area to aid injury recovery, hypoxic chambers simulates conditions high above sea level. work on the stuff they can't see or don't like to do. They promise themselves they will do it tomorrow, but tomorrow never comes. As a college strength and conditioning coach, I encountered the same problem early in my career. I came to the early realization that Monday would always be lower-body day. This was done for one simple reason. Every day, I was forced to do battle with human nature. Athletes are no different than the average gym-goer. They want to do what they like. I was like the parent who needed to say, "No TV until your homework is done." When we first began developing training programs for athletes, they were just like the folks described above. 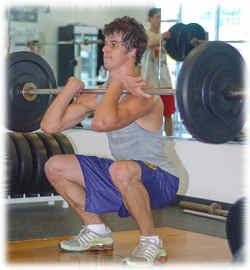 Athletes who were not on a program would wander into the weight room, do a couple of sets of bench presses, and then wander over to the curl bar for a few sets. After this, they would simply leave. My solution to this problem was simple. The first day of every week was always a lower-body day. This meant that athletes would return the next day to do the stuff they really wanted to do. A simple but effective solution. The solution for a fitness person is even simpler. Perform a full body, every workout, every time you go to the gym. Do your lower body and pulling exercises (like chin-ups) first. Save the bench press and curls for last. If you just did a squat or squat variation, a pull-up variation, and then benched and curled, the result will be a vast improvement in your physique. The average person's work ethic in the gym is the equivalent of going to a restaurant, ordering dessert, getting too full from dessert and skipping the meal. Lots of empty calories and none of the stuff you need. The truth is that training is much like nutrition. Ever notice that everything that is good for you doesn't taste very good? In addition, all the stuff that tastes great is fattening. Exercise is the same way. Most of the exercises that are best for you are the ones that are least popular -- and seem to hurt the most. Have you ever noticed the popularity of exercises where you sit or lie down? The whole machine concept is based on appealing to the lowest common denominator of human nature. You can exercise while seated on a padded chair. Just remember, if it seems to good to be true, it probably is." So true Coach Boyle, so true. After an analysis of six studies and more than 800 subjects, the October 2007 issue of The Cochrane Library reported that in people with osteoarthritis of the hip or knee, pain may decrease by one point or more on a scale of 0-20 by participating in aquatic exercise and that physical function may improve by three or more points on a scale of 0 to 68. Most of the studies measured patients after three months of aquatic therapy. Did you know women gain 98% of their skeletal mass by age 20? This is a HUGE reason why it's so important to strength train and practice good nutrition habits starting at an early age. 1. Eat every 2-3 hours, no matter what. You should eat between 5-8 meals per day. 2. Eat complete (containing all the essential amino acids), lean protein with each meal. 3. Eat fruits and/or vegetables with each food meal. 4. Ensure that your carbohydrate intake comes from fruits and vegetables. Exception: workout and post-workout drinks and meals. 5. Ensure that 25-35% of your energy intake comes from fat, with your fat intake split equally between saturates (e.g. animal fat), monounsaturates (e.g., olive oil), and polyunsaturates (e.g. flax oil, salmon oil). 6. Drink only non-calorie containing beverages, the best choices being water and green tea. 7. Eat mostly whole foods (except workout and post-workout drinks). Simply following the above should produce HUGE improvements in your body composition, self-image, and performance in the gym. Instead of attempting to master all of them, simply try a couple at a time and let me know how you do. I just finished, and highly recommend, "Men's Health Power Training." Coach Robert dos Remedios, a former NSCA Award Winner, did an outstanding job. 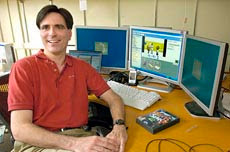 He covered all angles and kept things easy to follow, including sample workout templates and plenty of illustrations. He didn't throw in meaningless machine-based exercises. Rather, he stuck to the worthwhile exercises (free weight stuff, bodyweight exercises). If you read it, let me know what you think.